The LWK Loft Ladder is a folding loft ladder made of the highest quality pine wood, supplied with an insulated hatch door, red painted metal handrail and stile ends (available only in the 3 section version). The hatch door is white on the inside and outside. The treads protrude beyond the front of the ladder and there is a considerable space between the ladder and the hatch door. Such a design makes stepping into the treads easier, thus increasing the ease of using the loft ladder. The red painted metal handrail is mounted on the ladder's angle brackets. This makes climbing the loft ladder easier. The brown stile ends, mounted on the ladder feet, enhance the beauty, project the floor and increase the loft ladder's stability. Normally a 36mm thick insulated hatch door is installed with all our loft ladders. The hatch door is a pine wood frame, finished on each side with a white or beige HDF panel and the space between is filled with energy saving foamed polystyrene. The insulation coefficient is 1.1W/m²K. The outer side (visible when the door is closed) of the hatch door is smooth with no fixing points visible. The lock and the metal pole supplied make closing the hatch door easy. 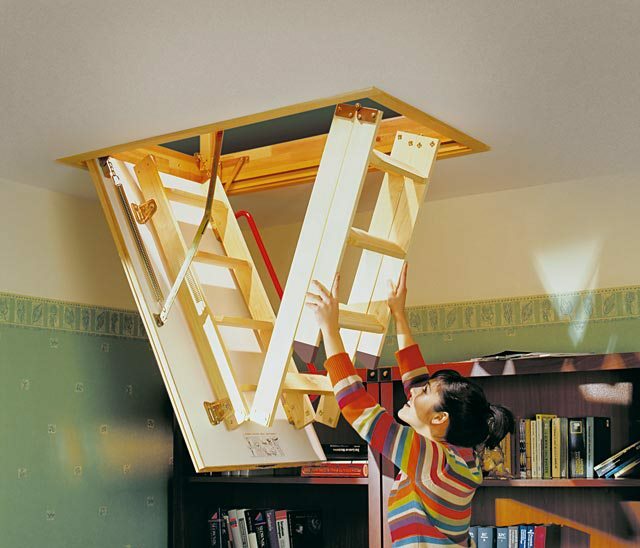 The unique hatch door opening mechanism is designed in such a way that it does not hinder your access to the loft. The mechanism locks the entire ladder in position when open, ensuring it is stable for operational use. The springs can be adjusted to optimise the momentum (force) of the lid when it is being opened. All ladders' hatch doors are fully edge sealed with a sealing strip to minimise heat loss. Treads are fitted using dovetail joints for added durability. There is a space between the treads and the hatch for more comfortable foot positioning onto the treads and safety grooves are cut into the treads to prevent slipping. The angle brackets fastening the ladder to the hatch enables the positioning of the ladder to be adjusted.